Very briefly, this post will summarize scholars’ current understanding of what settler colonialism is and characteristics of settler colonies. Examples will be drawn from the two case studies I examine in my comparative research on the development of settler colonies in the American Midwest and French colonial Algeria. Please Note: I do not claim to cover every aspect of settler colonialism, particularly its impact on Native communities, in this post. This is meant as an introduction. Other posts will explore the processes of conquest, the many ways in which settler colonies sought to “remove” Indigenous peoples, as well as Indigenous perspectives on the invasion, responses to it, and efforts to preserve their societies. Settler colonialism was (and is) a process in which colons emigrate(d) with the express purposes of territorial occupation and the formation of a new community rather than the extraction of labor or resources (however, these may have been or become secondary objectives). Settlers believed that it was necessary to remove the Indigenous population from the land they claimed. Indeed, Patrick Wolfe, an anthropologist and scholar of settler colonialism, argues that the elimination of Indigenous peoples itself became the organizing principle of settler colonial society and territoriality became its “irreducible element.” Scholars such as Wolfe and Lorenzo Veracini have argued that land acquisition as well as the wealth and opportunities it brought were the principal factors that motivated settlement and necessitated the interminable process of Indigenous dispossession, elimination by various means, and the legitimation of settler sovereignty over both land and people. Both dispossession and attempts to establish legitimacy were means to gain access to Native land, resources, homes, and other physical structures in order to profit from the built and rebuilt environment. Thus, settler colonization was a process driven by capitalist impulses, which also sought to institute settler political, cultural, and economic hegemony. Unlike the dyadic relationship formed between métropole and colony in extractive colonialism, settler colonialism generated a network of relations between four key sets of actors: metropolitan officials, colonial administrators (both military and civil), the Indigenous population and the settlers. In settler societies, colonists commonly articulated two contradictory desires – one for autonomous settler government in which they could handle their own affairs as the saw fit and the other for metropolitan resources and military support, especially for the purpose of managing settler-Indigenous relations and as a means of dispossessing Native people. The United States and France developed similar solutions to the dilemma colonists posed – solutions that were unique among other mother countries with settler colonies. The American federal system incorporated colonized territories into the union as states, and France annexed Algeria to satisfy settler desires and enrich the métropole. Each granted settlers representation both locally and in metropolitan government and provided for their military defense, and revenues raised through taxation and land sales went into metropolitan coffers. The settlers occupied the tenuous position as exogenous others who claimed rights to land and sovereignty over the Indigenous populations in the colonies. They therefore needed to establish their legitimacy in the eyes of those they sought to rule, in their own, and in those of the métropole. 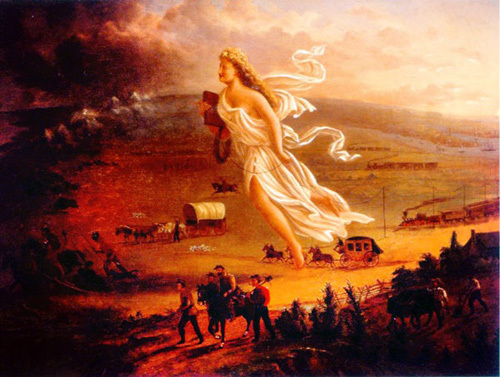 As immigrants and as colonists attempting to assert their right to autonomous government, they needed to craft a new identity that set them apart from both the indigenes and the metropolitan population and bridged differences based on class, ethnicity, and nationality, so settlers attached their identity to the land itself, to the mythologized common experience of settlement, and often to the idealized shared goal of self-government. Metropolitan society and politics were often perceived as decadent and corrupt, so settlers sought to distance themselves from their customs while at the same time using their relationship to the mother country to establish their authority. In their quest for legitimacy, settlers also appropriated Indigenous symbols, a process that occurred simultaneously with the promulgation of one or several myths about “vanishing” indigenes, terra nullius (barren lands), and/or assertions of manifest destiny. These myths allowed settlers to rationalize the appropriation of indigenous land and symbols and to declare the legitimacy of their sovereignty. All of these discursive moves helped to unify settlers, a necessary step toward self-government. In most settler colonies, greater equality among the colons emerged than was experienced among metropolitan inhabitants. Immigrants to the United States who moved west to take advantage of inexpensive frontier lands were quickly granted American citizenship rights and considered equals among their peers, especially in matters of local government. The same process was repeated in Algeria and was even more imperative because the French were actually a minority of the settler population in some locations, such as colonial Bône (Annaba) in the province of Constantine. Many settlers believed that their civil rights and the security of their own democratic institutions rested on the subordination of indigenous people and required their dispossession. Historian, Aziz Rana observes that the American settler empire, “for all its brutality … was the servant of a unique and robust view of self-rule seen by many as crucial to the fulfillment of emancipatory ambitions.” Republican governments and democratic principals in the métropole often went hand-in-hand with repressive settler colonial policies that targeted and excluded the Indigenous population. Frontiersmen and women became the symbol of what it meant to be an American, even though many were newcomers. Such was the power of the land to transform Europeans into Americans, concluded Frederick Jackson Turner as he reflected on what the closure of the American frontier meant in 1893 in a powerful statement that continues to provoke discussion and debate among historians of America’s frontiers and borderlands. In a similar way, settlers in French Algeria also identified themselves with hardy, courageous, self-sufficient, and egalitarian farmers. However, there were far fewer independent free-holding farmers in Algeria than in the North American territories. In fact, large corporate interests and wealthy individuals comprised the majority of French Algerian landholders. In settler colonial systems, métropoles and settlers shared concerns about Indigenous threats to colonists’ safety and therefore exhibited a preoccupation with militarism. This took different forms in the United States and Algeria in the time period chosen. In the American Midwest, militias were largely responsible for securing settlers’ safety, and the military was only sent when the militias were incapable of suppressing Indian attacks. However, as historian Francis Prucha has demonstrated, the United States always made it clear to settlers and Indigenous populations alike that military power backed legislation as well as the agents responsible for carrying it out in territories over which the United States claimed jurisdiction (which included “Indian Country”). In Algeria, the military was responsible for the administration of the colony, ensuring settler safety, as well as opening up additional lands to settlement. Whether conducted by militias, organized armies, or individual settlers, colonizers in both regions often resorted to coercion, force, and violence in response to Indigenous resistance. After the period of conquest, occupation, and initial settlement, when the region was considered “pacified,” settlers were able to elect their own representatives and leaders to govern local affairs and thereby establish relatively stable settler governments. Settler leadership was not appointed by the métropole at this stage, nor did active military personnel working in a military capacity fill the positions. These governments were civil, self-governing, integrated with the civil metropolitan administration, meaning that settlers had voting rights and representation in Parliament/Congress, and they had subdued/ “pacified” the region under their administration by subjugating, silencing, removing, killing, and/or assimilating (in a limited way) the Indigenous population. This dissertation will examine the processes that brought these types of governments about in the American Midwest and Algeria. Thoughts, suggestions, and critiques are all welcome! Colonial Frontiers: indigenous-European Encounters in Settler Societies, Studies in Imperialism (Manchester ; New York: Manchester University Press ; Distributed exclusively in the USA by Palgrave, 2001), 2. Lucy Murphy’s A Gathering of Rivers: Indians, Métis, and Mining in the Western Great Lakes, 1737-1832 (Lincoln: University of Nebraska Press, 2000) and David Prochaska’s Making Algeria French: Colonialism in Bône, 1870-1920 (Cambridge, UK: Cambridge University Press, 1990) offer examples in which extractive colonialism through mining operations was combined with settler colonization in each location. Patrick Wolfe terms this compulsion to dispossess indigenes the “logic of elimination.” (Patrick Wolfe, “Settler Colonialism and the Elimination of the Native,” Journal of Genocide Research 8, no. 4 [December 2006], 388). Wolfe, “Settler Colonialism and the Elimination of the Native,” 388; Lorenzo Veracini, Settler Colonialism: A Theoretical Overview (New York: Palgrave Macmillan, 2010). Based on Veracini’s similar argument for a “triangular” system, which included métropole, settlers, and Native peoples (Veracini, 6). However, I argue that the military and colonial administrators on the ground (often the same people) constituted an important fourth key set of actors in settler colonial systems. Lorenzo Veracini, Settler Colonialism: A Theoretical Overview; Annie Coombes, Introduction, [Book], 3; Nira Yuval Davis; Robert Weitzer; Aziz Rana, The Two Faces of American Freedom, 8. Rethinking Settler Colonialism: History and Memory in Australia, Canada, Aotearoa New Zealand and South Africa, Studies in Imperialism (Manchester ; New York : New York: Manchester University Press ; Distributed exclusively in the USA by Palgrave, 2006), 8. Unsettling Settler Societies: Articulations of Gender, Race, Ethnicity and Class, Sage Series on Race and Ethnic Relations v. 11 (London: Sage, 1995); Lorenzo Veracini, Settler Colonialism: A Theoretical Overview (Houndmills, Basingstoke ; New York: Palgrave Macmillan, 2010); L. Veracini, “ISOPOLITICS, DEEP COLONIZING, SETTLER COLONIALISM,” Interventions 13, no. 2 (2011): 171–189; Aziz Rana, The Two Faces of American Freedom (Cambridge, Mass: Harvard University Press, 2010), http://ezproxy.msu.edu:2047/login?url=http://site.ebrary.com/lib/michstate/Top?id=10448659. Ibid., 82; Rana, The Two Faces of American Freedom, 8–10; Unsettling Settler Societies, 11; Margaret Wetherell and Jonathan Potter, Mapping the Language of Racism: Discourse and the Legitimation of Exploitation (Harvester Wheatsheaf, 1992), 124–5. in both locations I’ve chosen, these claims could not be supported but (at least in the US) were made anyway. The Indigenous population was clearly not dying out in Algeria, and Richard White suggests that population in the American Midwest had recovered from the shocks of the late 17th and early 18th c. and was actually increasing (Richard White, The Middle Ground (1991), ch. 11). David Prochaska, Making Algeria French: Colonialism in Bône, 1870-1920 (Cambridge [England]: Cambridge University Press, 1990). Frederick Jackson Turner, “The Significance of the Frontier in American History,” Paper read at the meeting of the American Historical Association in Chicago, July 12, 1893. It first appeared in the Proceedings of the State Historical Society of Wisconsin, December 14, 1893. It is available online: http://xroads.virginia.edu/~hyper/turner/ (19 June 2012). Prucha, The Great Father (among others).